How do you return students’ graded papers to them? Returning papers can take up so much time, there has to be a better way. Through the years, I’ve tried countless different ways but I have yet to find the perfect way. I’ll share a few of the ways I’ve tried and then I’d love to hear your ideas. Maybe together we can solve this dilemma. With this system, I graded papers and stuffed them in folders that were sent home on Fridays. This system, by far, took the least amount of class time. Ya for that! But . . . drum roll . . . it took many hours, hours of my personal time, to stuff the folders. Think of how much time two students helpers spend a week stuffing the mailboxes. Then take that times two since there are two students mailing the papers when there is only one of me and you can see why this system is so time consuming. The glitches to this system is what do you do when students forget to return their folders? The big positive about this system is parents knew graded papers were coming home on Friday. The consistency factor of this system is a major plus! Signatures on tests and other required paperwork came back from parents better with this system. Wrap up was the last 15 minutes of the day. Students were assigned jobs to do during wrap up. One of the jobs was passing back graded papers. The plus of this system was students got feedback (grades) quicker. When graded papers went home on Fridays, the papers weren’t always looked at which is a shame because students miss out on an opportunity to learn from their mistakes. The other thing that happened with this system is I often found graded papers on the floor after students left at the end of the day. Paperwork that required parents’ signatures did not come back as readily with this system. 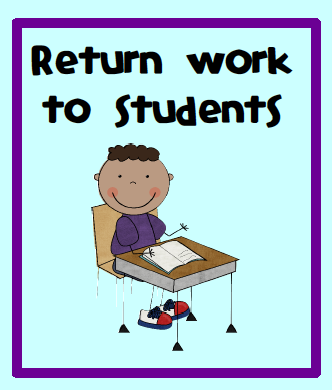 How do you return your students’ work? Since I teach 8th graders, I make it a classroom job to return papers. I have magnetic folders that hang up in the classroom and it is the "Paper Returner"'s job to see that there are papers to be returned and find time to return them. Usually they do this while we are going over the Warm-Up and it is surprisingly not a huge distraction because the class is focused on me going over the Warm-Up and not the student passing back papers. If they finish a classwork assignment or test early, they will return papers then too. This is the best way I have found to get those papers returned. That's a good idea! I like it! I teach kindergarten. To collect papers, I have my kids push their papers to the center of their large circle tables into a stack. A child then goes to each table, picks up the papers, and brings them to me. I send home a daily folder and put in papers that I don't want to keep as evidence of learning. The parents sign conduct at the end of the week, and usually I get time-sensitive things signed! It works for me. Thanks for giving me some other ideas to think about!! I 'grade' papers in front of students and return to them immediately with feedback. If this is not something you can do, have you thought of doing table/team baskets? This way you can collect them from the team basket and then return to the same basket. the kiddos can find their own paper and help save a little bit of time. You could even have a team captain that is in charge of collecting the papers for you. I return work in the same manner. Your mailbox idea is my file folder system on the back counter where important papers are stored and taken home in a weekly folder once a week to be signed by parents. I include a 2way communication log in the folder so parents can ask specific questions about the papers that come home. It works out great and is excellent documentation! I started doing "Weekly Work Packets" a few years ago and I love them! I have a file box with hanging files with each child's name on it. Throughout the week as I grade stacks of papers I file them away under each child's name. (I also always make sure my parent helpers know where the box is. Most of the time if they come in and see I am busy they just go to the box and start filing!) At the end of the week I staple a progress report to the front with any important papers and send them home Monday morning. I get a lot of comments from parents that they love this system, they always know just how their child is doing with the progress report (I include reading fluency, math facts fluency, and behavior reports) and they know they are getting all the papers in one nice organized stack! It takes a little organization but pays off in the end! I like Heather's method. I'm sure parents appreciate the regular updates. In my First Grade classroom, we use mailboxes with folders inside. Like many others I have student helpers file the papers usually. I am a first year fourth grade teacher. I like the mailbox system. 1. My dear friend gave me hers. 2. It is something I can see and the students can see. File folders make me crazy because they never get put back correctly. 3. If graded items that need to be signed, I put them in the box and my mail sorter does the rest. 4. Paper filing makes me crazy. As organized as I am with my teaching and management of my room, paper gets the best of me. A bin for each table or group of desks. You put the graded work int he bins and each day the group captain makes sure each person at his or her table gets their papers. Also make use of that mailbox system for tests you want signed and returned or important time sensitive notes like trip permission slips. Have each table come up and get their mail at the end of the day on their way to their coats/backpacks if they have lockers outside the classroom keep it by the door. The kids are responsible for the unimportant graded work that if it is lost, no one is gonna have a issue with…and you only have to deal with the important things and yet the students that are responsible will take pride in being trusted with their own daily work and the ones who are not up to that yet, you are being responsible for making sure they get the really important things. Best of luck with fine tuning a system that works for you! I like the mailbox idea, but maybe have a smaller mailbox for each table/group? That way each group can file their own papers, and you can put them in different locations in the classroom so it is faster for everyone to get their own papers? This makes it easy for parents to see what is just regular work/art and what is important to get signed and returned. My school implements a school-wide "Take-Home Tuesday." All school correspondence goes home on this day, so parents know when to expect it. The way I deal with returning student work in my 3rd grade classroom is to have students put their numbers as part of their heading. When work is collected, I have the paper collectors go ahead and put the papers in order by number, so it is already alphabetized. When I grade, I can go straight down my grade book and not have to put much thought in searching for a particular name. As I grade, I go ahead and put papers in students' individual file folders (kept in a crate, in alphabetical order). When it comes time to stuff our Tuesday folders, I just pull the stack of papers out of a child's individual folder and staple them together and place in the Tuesday folder. I staple the papers together so that the students will be less likely to remove work they did not do their best on. I also include a parent signature page that is stapled in the back of the Tuesday folder for parents to sign to acknowledge they received the work stapled together. I do ask for the work to be returned so I can have some for display, data binders, work samples, etc. And, on Tuesdays, I just have a homework helper pass out Take-Home Tuesday folders along with the regular homework. It sounds like a lot, but it really works for me. Once you get into the routine of doing this, it becomes automatic.